I was in trouble. I would not be able to repeat my slow creep around those crumbling arches again. Threatened with a series panic attack, I did a stupid thing. I started sprinting back the way we had come, leaping across the narrow passageways around the arches. The crew was stunned and said later, all they could do was stand, watch, and wait for my inevitable fall into the valley below. Somehow, I made it. My guardian angel must’ve been working overtime. 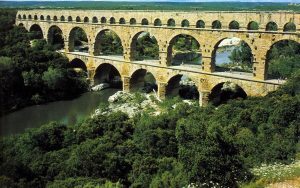 I still get shaky knees remembering that visit to the Pont Du Gard. Good story. Not as adventurous as you, Carol and I spent an afternoon sitting on the bank of the Gard and sketching the Pont. Jim, I too am not good heights. Recently when Bonnie and I visited the Grand Canyon, I could not get close to even the railings without holding onto her hands. And I can attest to weak knees and sweating shirt. I think my hands were wet just reading your article. Good going Jim. You made it back to golf another day. Great experience and hopefully not to be repeated.